The shortest distance in the world is the space between hero and heel. 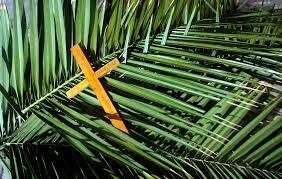 On that first Palm Sunday the cheering crowd lay palm branches in Christ’s path as he entered Jerusalem. By that Friday we call “Good,” how many of those same voices were crying, “Crucify him!”? Jesus was not surprised. The prophet had said long ago that God’s servant would be “despised and rejected” (Isaiah 53:3). And we’re told that Jesus “knew what was in man” (John 2:24), that he knew humans “inside out” and “didn’t need any help seeing right through them” (The Message). But it had to hurt. On Sunday, a crowd is praising; on Friday, a crowd is cursing. On Sunday, they’re praising the one they hope will inaugurate an earthly kingdom and shed the blood of the hated Roman conquerors. On Friday, they’re screaming for the blood of the one whose spiritual kingdom seemed short of swords and firepower. But Jesus was not surprised. Soon he will look out over the city (foreseeing her doom) and weep, “Jerusalem, Jerusalem, you who kill the prophets and stone those who bring you God’s news . . .” (Matthew 23:37). Now Entering Jerusalem: Hometown of [Supply Prophet’s Name] read the signs put up by the Chamber of Commerce. No fine print mentions the names of the upstanding citizens who’d years ago put the prophets to death. “The shortest distance . . .” Short and selective memories, too. But what if Jesus had just agreed to be the kind of king they wanted? Judas probably could have saved his blood money. James and John could have taken seats as Secretary of State and Secretary of Defense, though the Romans might not have let that “kingdom” last long. Yes, but if Jesus had simply listened to Satan, agreeing to bow before the Prince of Darkness in exchange for worldly power, Rome would’ve gone down! I wonder how many despots today, not to mention their predecessors already moldering in history’s dust bin, would grab just such a deal? (Or name any size tyrant, any size venue.) What if Christ had chosen to call legions of angels to take him off the cross and destroy the world (he knew that he could), well, talk about power! What if, like the crowd in Jerusalem, we prefer Jesus to be the kind of king who’ll give us everything we want—easy lives, health, wealth, success, political clout, etc.? And what if he doesn’t? The crowd wants a revolution. Judas wants one, too. Right now! Peter pulls out a sword to fight. And Jesus, with power completely beyond the understanding of power players and blowhards, shakers and movers, fighters and king-makers, is so strong that he lays down his rights even as he lays down his life, and he dies to do the will of his Father and save weak and selfish rights-mongerers like . . . us. We’re curse-hoarse from yelling “Crucify him!” as he quietly refuses to be the kind of king we want. Nailed to the cross, held not by spikes but by quiet love-filled might that puts the world’s “mighty” utterly to shame, he shows himself to be exactly the kind of King we need. “Therefore, God has exalted him to the highest place . . . that at the name of Jesus every knee should bow . . .” (Philippians 2:9-10). Even the title of Truss’s (note the possessive) book makes me smile. Two pandas adorn the dust jacket. One is on a ladder inserting a comma after “Eats,” and the other is walking away, two-leggedly upright, holding a pistol in one paw. You see, the installation, or not, of that comma matters. 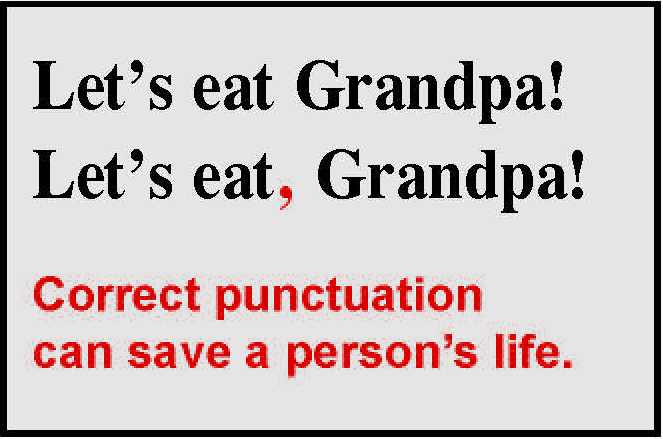 (And you can count me firmly in the camp of the “Oxford comma”—comma in a series—folks who’d argue that, if a comma after “Eats” is included, an additional comma after “Shoots” is also in order.) If you opt for a comma or commas, the panda in question is a full-bellied criminal on the run after assault with a deadly weapon. If you opt for no commas, he’s simply being described as a typical panda. 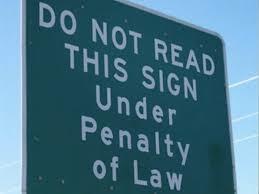 Oh, and here’s a note to give one pause. (Why does that make me think of pandas’ paws?) The earliest manuscripts of the Bible were written with basically no punctuation at all. The early manuscripts of the New Testament contained no punctuation AND were written in all capital letters. I survived two years of biblical Greek, which I’ve mostly forgotten, but we rarely messed much with capitals and, since I was never a fraternity member, I’m quite fuzzy on them. Throw me overboard into an ancient Greek manuscript, and I’d be completely at sea. We really needn’t worry much about such. I think we can be very sure, and immensely thankful, that we have God’s revealed Scripture and that folks whose job it is to worry about translation and thus punctuation do, on the whole, an amazing job. But don’t try to tell those Maine dairy drivers, or pandas whose character is in question, that comma placement doesn’t matter. Well, we’ve just made it through one more time change. I’ll check in a minute (note the subtle time reference), but I always have to think about whether we’re going ON to Daylight Saving Time or going OFF of it. ON is the spring thing, right? We seem to be doing one or the other pretty much all of the time, or at least every ten minutes or so. About the time my internal clock makes peace with the most recent chrono-lux-economy change, it’s time for the next one. The handy little mnemonic device . . .
By the way, mnemonic devices are handy by default (and what a cool word); I don’t recall ever meeting an unhandy mnemonic device. If I don’t recall it (that ill-fated meeting of a device designed to help one recall stuff), it’s probably because I failed to grab one of the assuredly handy little mnemono-thingies as it scurried by). I digress. The best mnemonic device for DST’s advance or retreat is “spring forward, fall back.” So last night before heading to bed, having conjugated “spring” just for good measure (I spring, I sprang, I have sprung), I sprang up off the couch in search of clocks from which to steal an hour. Ah, but before any of us waste time in this supposedly light-saving mandated clicking, turning, tapping, or dialing forward of more clocks than any home, vehicle, or office can possibly need, we face a precision decision. Adrian Monk (I loved that TV series) supposedly had two carpentry levels. One he occasionally used; the other was his level-checking level which, twice a year, he took to a hardware store to be calibrated. A man after my own heart. My clock-checking clock is the U. S. Naval Observatory’s master clock. The Department of Defense (and most of the world) trusts it. Since it is supposed to “neither gain nor lose one second in about 300 million years,” I accept it as a pretty decent standard for me, too, as I’m standing in the kitchen amidst three digital clocks—two on ovens and one on a microwave—and trying to get them to agree and move on to the next displayed minute within a window of discrepancy I can tolerate. My rule is that they need to be displaying exactly the same time three-quarters of the time. (I can live with that; Mr. Monk could not.) 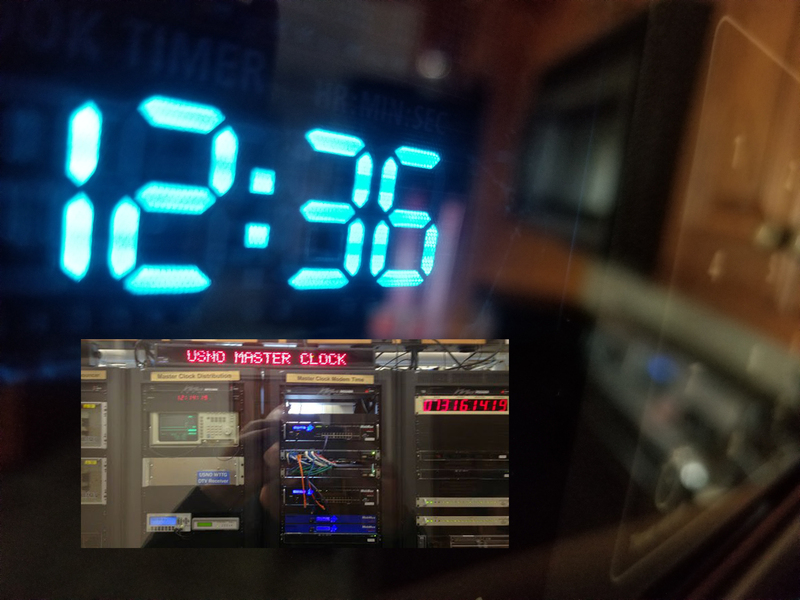 Anyway, once I’ve determined that my computer and my cell phone are both in agreement with the USNO master clock, the time-setting commences. They (the experts) say that this twice a year time-tinkering (look up biannual, biennial, and semiannual to view an all-out brawl between word-parsers) has some advantages, but it can mess a bit with our Circadian rhythms and thus our sleep. And that, I postulate, tends to make some of us a little loopier and a tad more eccentric than usual. I offer this column as support for that belief. I love the Apostle Paul’s meaning-packed phrase in Galatians 4, “When the time had fully come . . .” That’s when God sent his Son to save us and, the apostle writes, to free us from the futile slavery of trying to save ourselves. Nothing in the universe has been the same since that Son-light-giving saving time.